Cascadia High speed rail is one step closer to being reality, after a study commissioned by Washington State was published on Thursday, December 14th. A high speed rail line linking Vancouver BC, Seattle WA and Portland OR would cost between $24 billion and $42 billion US dollars, and attract an initial ridership of 1.8 million. 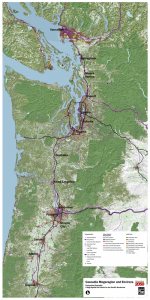 The study was conducted by the Washington State Department of Transportation (WSDOT) and written over a period of five months. It cost $360,000 – with the majority of that coming from the Washington legislature, and $60,000 coming from private investment, with the majority of private funds coming from Microsoft. 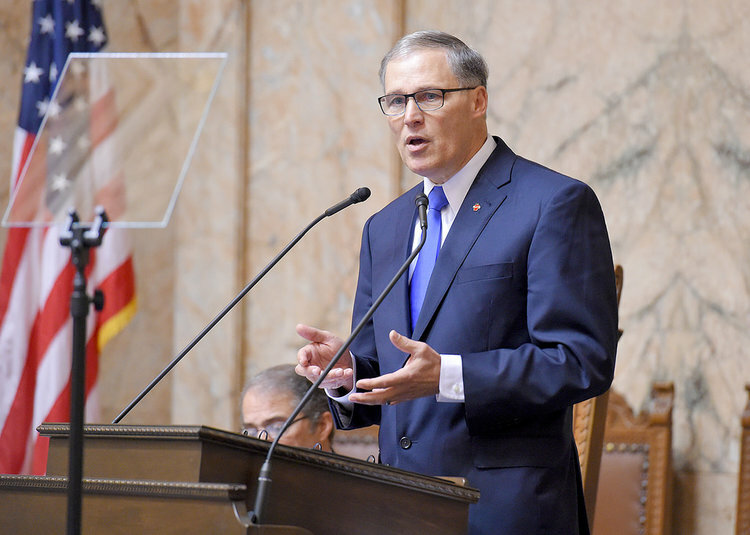 Washington State Governor Jay Inslee announced the results at a press conference after the study was released to the WA Joint Transportation Committee. The report was shared with Washington Legislature’s joint transportation committee December 14th. You can view the TV recording of the press release here. – Charles Knutson, Executive policy adviser to Jay Inslee. The 76 page study examined three different types of technology, including high speed rail – which tops out at 365km/hr (226mph), maglev 430-600km/hr (267-330mph) and hyperloop (unknown?? ), and looked at potential routes, costs, stations locations, costs, ridership and how to collaborate across an international border. Once established – the route could also be expanded along eastern corridors to Spokane or south to San Francisco and Sacramento – the terminus of the California high speed rail. Seattle and Portland would have the heaviest ridership – accounting for approximately half of the trips, while about a quarter would be between Vancouver to Seattle. There are many different advantages and costs to each technologies – maglev for example has a higher up front cost, but lower maintenance and operation fees. It would be able to pay for itself by 2035. 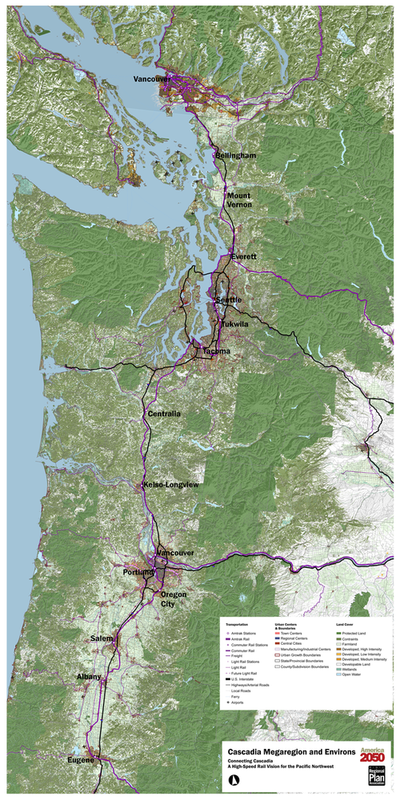 Cascadia High Speed Rail has long captured the imagination of the Pacific Northwest – from the Pacific Northwest Economic Region in 1992 to the Cascadia Mayors Council in 1996. It’s first real boost came in the early 2000’s. The proposed route would extend along the Cascadia corridor – an area from Vancouver B.C. down to Portland which has been termed an emerging megaregion by the National Committee for America 2050 – defined as an area where “boundaries begin to blur, creating a new scale of geography”. These areas have interlocking economic systems, shared natural resources and ecosystems, and common transportation systems link these population centers together. This area contains 17% of Cascadian land mass, but more than 80% of the Cascadian population. America 2050 Cascadia Megaregion Map. Investment in high speed rail has support from high level government officials in British Columbia and Canada at broad – as well as those in Washington and Oregon. Governors in Washington and Oregon have both pledged support – while British Columbia Premier John Horgan and Prime Minister Justin Trudeau also openly support the idea, as well as a wide variety of environmental, labor and business leaders and the general populations as a whole. 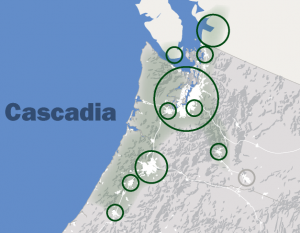 The ultra-high-speed line would not replace the existing 18-stop Amtrak Cascades route between Vancouver and Eugene. Previous ArticleUSPS Holiday Deadlines are coming up!